Steve, The year of this incident must have been during Sunday Cycle C. This year is Cycle B, wherein the Gospel for Corpus Christi Sunday is Mark 14:12-16, 22-26 – which is of the Last Supper, not the multiplication of the loaves and fish (e.g. Year C). Year A is John 6. STEVE RAY HERE. YOU ARE CORRECT. IT WAS A YEAR OR TWO AGO, BUT IT WILL COME UP AGAIN! THANKS FOR LETTING ME KNOW — EVEN THOUGH I SHOULD HAVE KNOWN (BLUSH). This one goes with the story about how walking on the water was just walking on a sandbar. Of course, that happened (a) at night, (b) during a storm, and (c) in front of experienced fishermen. Not a very plausible action for a mere carpenter! I wish these types would have the courage to call it a lie when they mean it’s a lie. They’d be very much in the wrong, but they would be more honest and would probably do less damage; at least the congregation, and hopefully the bishop, would know what they were dealing with. There is one and only one justification for either of these two retelling of the gospel stories — a fundamental belief that miracles do not happen. And the only way to be sure of that is if there really is no God to perform the miracles. Greetings, Steve and all! I am very thankful that as a convert-in-progress I live in a tiny rural town and go to a small Catholic Church with a wonderful old Irish priest, hence have not had to hear any such homilies. What strikes me about these heresies is the rejection of the Divine and the elevation of the human. What a shame, when Catholicism is so wonderfully full of the Divine, without compromise. Well, God’s holy will is being done, and the gates of hell will NOT prevail against his Church. I’ll trade you my mackeral for yur mackeral. At what point is it OK to stand up when heresy is being preached from the pulpit? This case seems rather borderline. I have heard some other whoppers from the pulpit that are far worse than this — some concerning core doctrines of the faith. I almost stood up at one, but chickened out. No more, I’m thinking. My wife’s concern is with the sanctity of the Mass, but as far as I’m concerned, that flew out the window when grave heresy was preached from the pulpit. 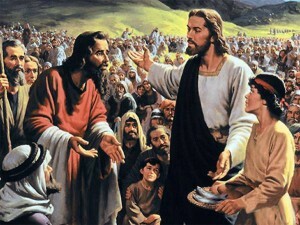 If the food was brought by the 5,000, why would Our Lord have the remnants collected for the poor. It was their food not Our Lord’s. Also I don’t think Our Lord created additional fish and loaves but the 5,000 ate the original loaves and fishes to illustrate that in the reception of Communion there are many hosts but each person receives the same Christ. How funny, that is the EXACT homily I heard today! My eyes rolled uncontrollably. Yes, those 5000 men were ALL a bunch of horders, until the Lord showed them how to share what they ALREADY had in abundance. And so we should share too. Not a peep about this being a prefiguring of the Eucharist, I am so sorry to say. STEVE RAY HERE: AMY, PLEASE PRINT OUT A COPY OF MY ARTICLE AND GIVE IT TO THE HOMILIST. TELL HIM IT IS COMPLIMENTS OF STEVE RAY. Well, on Corpus Christi this year, we got a visiting priest who was a socialist. He started out by praising Obama, then moved on to all but denying the Real Presence, focusing his whole homily on how the whole of humanity is the body of Christ, how this body is the only really important one, and how we are obliged to spend every waking moment taking care of the other members of this body. 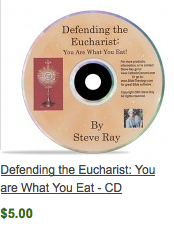 Hardly one word about the Eucharist except to downplay it as not all that important. I was steaming by the time Mass was done. I blogged about this very topic today. I couldn’t very well walk out of the Mass, (my husband and kids would be embarrassed), so I blogged. (And this is in the Archdiocese of Denver with the very capable Archbishop Chaput at the helm). Link to article from This Rock no longer works. Maybe Jesus didn’t turn water into wine after all! Maybe the real miracle at the wedding feast of Cana was that Jesus got a bunch of heavy drinking partiers to loosen up and pitch in their hidden bottles into the jugs, and the waiters thought they were pouring in water! Steve Ray’s Blog » Goofey Homilies on Multiplication of Loaves?